Japanese Episode AG 016: "Kanazumi Jimu! Nozupasu no Himitsuheiki!!" American Episode 288: "The Winner by a Nosepass"
The time for Satoshi's first gym battle has arrived, and as he and Pikachu are doing some last-minute Iron Tail training, Haruka announces that she wants to participate in Pokemon Contests in lieu of Gym Battles. Everyone wishes her luck in her endeavors, and soon after it's time to start the battle. Tsutsuji's first pokemon is her Ishitsubute, and Satoshi answers with his Kimori. 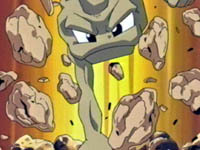 Kimori has the type advantage but doesn't know any grass-type attacks, and soon its inability to use techniques other than physical attacks costs it the battle. Satoshi then chooses Pikachu, a move that surprises Tsutsuji. Satoshi has his Pikachu flatten the battle field with its Thunder technique so that Ishitsubute's Roll attack (Rollout) cannot work. A powerful burst of electricity at close range is able to knock out the rock-type pokemon, so Tsutsuji brings out her second pokemon--a Nosepass! The compass pokemon has a number of surprising attacks, and for a while it seems to have the upper hand on the little mouse pokemon. When Nosepass uses an electric attack against Pikachu, the attack is bounced back at it and paralyzes the rock-type pokemon. With Nosepass now paralyzed, Pikachu is able to use the extra time to build up enough energy for an Iron Tail attack. Pikachu K.O. 's the Easter Island pokemon, earning Satoshi his first victory in a Houen Gym. Tsutsuji gives Satoshi a Stone Badge, and Satoshi triumphantly heads toward his next gym. Now this is what we've been waiting for--Satoshi's first gym battle. What's nice about this one is how completely different it is from Satoshi's last rock-type gym battle in that Satoshi wins by skill rather than dumb luck. However, what still bugs me is the varying power of Pikachu's electric attacks. We're supposed to believe that electric attacks aren't supposed to work on rock-type pokemon, yet we see Pikachu destroy rock after rock in this episode? It can destroy all the rocks on the battle field with one Thunder attack? It can Thunder its way out of a Rock Tomb?? How are those rocks any different from the rocks that make up Ishitsubute or Nosepass? The dubbed version of this episode turned out better than usual. Because there is a lot of battle music used, 4Kids keeps a lot more of the Japanese music than they usually do, and when combined with the usual great translation and minimal cutting of footage, there really isn't a whole lot to complain about. I've actually been told that my comparisons have been "boring" lately, but I can only work with what I'm given. I mean really, do you want them to edit the show more just so you can have more interesting Episode Comparisons to look at? Nosepass, despite having the same name and cry in both versions, has its voice changed in the dub. In fact, 4Kids hasn't kept a single Japanese voice in all of Advanced Generation, but hopefully that will change in the future. I really should just add this to the General Edits page, because this is like the sixth consecutive episode that the episode has been zoomed-in on. C'mon, 4Kids, why are you cropping each episode like this? The commercial break in the dub occurs quite a bit earlier than it does in the Japanese version. Originally, the commercial break doesn't occur until Pikachu's first attempt at an Iron Tail against Nosepass. We see Satoshi order it to do the attack, Pikachu jumps toward the screen with its glowing tail, and then we see the eyecatch. We get back from commercial, we see the same shot of Pikachu jumping toward the screen with its glowing tail, and then we see the Iron Tail connect. To avoid repeating the same footage twice, 4Kids cut out the first shot of Pikachu jumping. Wow...only one time cut this go around. That's amazing. Anyway, three seconds is cut from the TO BE CONTINUED... screen.